Donna Leon's bestselling mystery novels set in Venice have won a multitude of fans for their insider's portrayal of La Serenissima. From family meals to coffee bars, and from vaporetti rides to the homes and apartments of Venetians, the details and rhythms of everyday life are an integral part of this beloved series. But so are the suffocating corruption, the never-ending influx of tourists, and crimes big and small. Through it all, Leon's Commissario Guido Brunetti has been an enduring figure. A good man who loves his family and his city, Brunetti is relentless in his pursuit of truth and some measure of justice. In Earthly Remains, the twenty-sixth novel in this series, Brunetti's endurance is tested more than ever before. During an interrogation of an entitled, arrogant man suspected of giving drugs to a young girl who then died, Brunetti acts rashly, doing something he will quickly come to regret. In the fallout, he realizes that he needs a break, needs to get away from the stifling problems of his work. When Brunetti is granted leave from the Questura, his wife, Paola, ships him off to a villa owned by a wealthy relative on Sant'Erasmo, one of the largest islands in the laguna. There he intends to pass his days rowing, and his nights reading Pliny's Natural History. The recuperative stay goes according to plan until Davide Casati, the caretaker of the house on Sant'Erasmo, goes missing following a sudden storm. Now, Brunetti feels compelled to investigate, to set aside his leave of absence and understand what happened to the man who had become his friend. 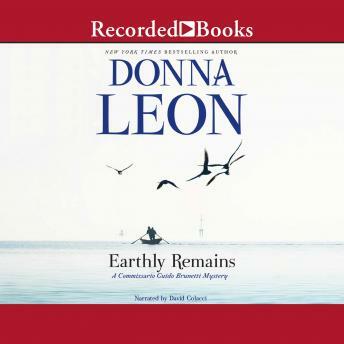 Earthly Remains is quintessential Donna Leon, a powerful addition to this enduring series.